Children under the age of 2 years old who are held by an adult and travel at 10-30% of the adult fare (regular airlines) or on a destination-based ticket (low-cost airlines) are not entitled to any baggage allowance, or their allowance is limited. Flight tickets for children aged up to 12 years are usually 25-30% cheaper than tickets for adults. These young passengers are entitled to the same or slightly lower free baggage allowance. As a general rule, you are permitted to take a foldable baby stroller with you at no charge. It is usually carried in the hold of the aircraft. You can take the stroller right up to the aircraft steps where it will be taken by the flight attendant and stored in the hold. Then you will need to carry your baby up to the aircraft entrance. The stroller will be handed back to you immediately after landing. There are two options for traveling by plane with children under the age of 2 years old: your baby can travel in their own seat, secured in a child safety seat (usually from the age of 6 months old) or on the lap of a parent or legal guardian. The second option is much cheaper (the ticket price is usually 10-30% of the adult fare, or is fixed and depends on the destination), and sometimes it’s even free of charge. This, however, will result in a different baggage allowance – infants are not allowed any checked luggage, or their allowance may be limited. Usually, you can check a stroller or baby basket carrier as hold baggage at no extra charge. Safety harnesses are available on request on board of every aircraft – they should be fastened whenever the “fasten seatbelt” sign is on. Generally, it’s possible – or even recommended – for children to travel in a car safety seat when on board the aircraft. Just like in a car, seatbelts designed for adults do not provide little passengers with security in the way that a proper child restraint system does. If you decide to use a child safety seat on the plane, make sure it’s appropriate for use in an aircraft. It should be labeled with a particular symbol. If the car seat does not fit safely into an aircraft seat (for example, it’s the wrong size), it can be carried in the hold for an extra charge. Some airlines allow the use of safety seats only to a certain age, such as for children up to 3 years old. Parents can bring baby food on board – standard rules on liquids in carry-on luggage don’t apply to water, food, or milk for infants. However, parents may be asked to taste the baby food during the security check at the airport. Most airlines have microwaves on board so you can ask them to heat up bottles. Usually, they also encourage families with children to board first to help them get seated before other passengers. 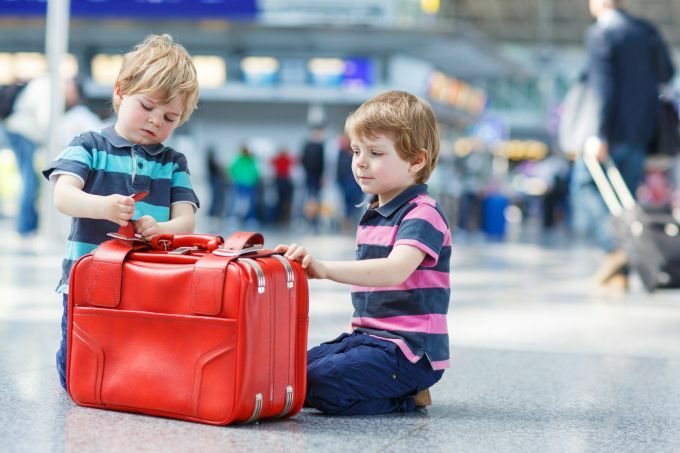 Below you will find a list of airlines and their regulations regarding baggage allowances for children: Aeroflot, Aer Lingus, Air Canada, Air France, Air Serbia, American Airlines, Austrian, Belavia, British Airways, Brussels Airlines, Bulgaria Air, Cathay Pacific, Delta Airlines, easyJet, El Al, Emirates, Etihad Airways, Eurowings, Finnair, Jet2.com, LOT, Lufthansa, Norwegian, Qatar Airways, Ryanair, SAS, Singapore Airlines, Sun Express, Swiss, TAP, Turkish Airlines, Ukraine International, Vueling, Wizz Air. Baby strollers are stored in the hold at no extra charge. Children under the age of 2 are entitled to the same baggage allowance as adults (it depends on the booking class). When traveling with a child you are allowed to bring a stroller, a baby basket carrier or a child car seat free of charge as checked baggage. Children traveling in their own seat receive the same baggage allowance as adults. Passengers traveling with an infant on the lap can bring on board 1 bag (up to 10 kg) in addition to their carry-on, free of charge. If you have a fully collapsible stroller you can take this right to the aircraft door. The staff will put it into the hold and return to you just after landing. This service is free. Different rules apply to large and heavy strollers. They can only be checked at the counter as hold luggage. Passengers traveling with an infant in Economy Class may request a bassinet (if the child cannot sit up unaided). Due to safety requirements, they can be used only for infants weighing less than 12 kg. However, bassinets are not available on all aircraft. Children up to 11 years may check-in a car seat without a fee in addition to their regular baggage allowance. On long-haul flights in Business, Premium Economy and Economy Classes passengers may request a bassinet. They can be reserved only for children weighing less than 10 kg and measuring less than 70 cm. Older children are allowed to travel in their own car seat. You are permitted to take a collapsible stroller and a car seat as hold luggage, free of charge. If you are traveling with an infant younger than 2 years of age on your lap, you can bring on board 1 bag which is no heavier than 12 kg and no larger than 55 x 35 x 25 cm. On top of that, you can take a second cabin luggage up to 10 kg for free. Children older than 2 years of age and those traveling in their own car seats receive the same baggage allowance as adults. Infants under the age of 2 years who are held by an adult are not allowed any hand luggage. Other children who occupy a seat are entitled to the same baggage allowance as adults. You are allowed to bring a stroller or a baby basket on board in addition to your carry-on. In Economy Class, infants up to the age of 2 years as well as older children have the same baggage allowance as adults. In Business Class, passengers with a 2-year-old can check-in 1 bag up to 23 kg and a foldable baby stroller. Older children – exactly like adults – can have 2 registered bags, each not exceeding 32 kg with a maximum dimension of 158 cm. Due to safety reasons, children are required to travel in a car seat which is appropriate to their age, weight, and height, and have a label indicating approval for use in aircraft. You are allowed to take on board a collapsible stroller and set of nappies, free of charge. A safety car seat (qualified for use in aircraft) can be taken on board for a child occupying a reserved seat. For infants younger than 2 years, you can take a car safety seat, stroller or baby carrier. A foldable baby stroller, car safety seat, or baby carrier can be taken on board the aircraft. An infant (0-2 years old) can travel on the lap of a parent or in any type of a child restraint device placed on an adjacent seat. On some routes, British Airways provides parents with specially designed bassinets. They should be reserved in advance. Children younger than 3 years are allowed to travel in their own car seats. Passengers traveling with infants (under 2) are able to bring an extra bag with the items that they may need during the flight (such as food, toys, or nappies). Older children have the same hand baggage allowance as adults. Older children will have the same free checked baggage allowance as their parents. When flying with infants, you will be allowed to check in one free bag, a collapsible stroller, and a car safety seat. Children aged 2-11 are entitled to the same hand luggage and checked baggage allowance as adults. When traveling with an infant (under 2) who is not occupying a seat you can bring on board a baby basket carrier or a foldable stroller as well as baby food. You are also allowed to check-in 1 bag up to 23 kg (except for the Check&Go fare which doesn't include any hold luggage). A checked baggage allowance for an infant under the age of 2 years includes 1 bag not heavier than 10 kg and a collapsible stroller. You can also take baby food on board. Your child can travel in his/her own car seat (approved for use on a plane) or you can make a request for a child restraint seat provided by the airline. It is available on most planes. All Cathay Pacific aircraft are equipped with special baby bassinets appropriate for children weighing 12 kg and less. A baby under the age of 2 years traveling for free on the lap of a parent cannot have any luggage free of charge. However, infants without a seat but paying 10% of an adult fare are allowed a checked bag up to 10 kg and a foldable stroller. Older children who pay at least 50% of an adult fare are entitled to the same baggage allowance as adults. Infants and children over 2 years old have the same hold luggage allowance as adults. It includes 3 items - each for a fee. Baby baskets for infants up to 9 months are available on most planes. For a child aged 2 or less, you can carry a foldable stroller, baby carrier, or car seat (free of charge). A checked baggage allowance for a child includes 1 bag not heavier than 10 kg. If the infant is not occupying their own seat, parents can check-in one additional piece of luggage up to 10 or 23 kg (depending on the route). They are also permitted one handbag for in-flight necessities and baby food that must not exceed 5 kg as well as one collapsible stroller or bassinet (all without a fee). At Dubai International Airport parents can use complimentary baby strollers to smoothly travel within the airport. Twin strollers are available too. Emirates provides infants (aged 2 or less) with pillows and blankets as well as 75 cm long bassinets. They can be used by children weighing less than 11 kg. Babies younger than 2 years can be carried on the lap or use car safety seats. Any child aged 2-3 is required to travel in their own car seats. When traveling with infants without reserved seats, you are allowed up to 23 kg of checked baggage (flights to and from the US, Canada, and Brazil) or 10 kg (all other flights). Hand luggage must not be heavier than 5 kg – regardless of the destination or your booking class – and it can include baby food and other in-flight necessities. There is a set fare of €15 each way for infants younger than 2 years and seated on your lap. A 20% discount is available to children up to 11 years old and infants occupying a seat. You can take a foldable stroller, car seat or a baby basket carrier for each child without a fee. An infant (0-2 years old) can travel on the lap of a parent or in any type of a child restraint device placed on an adjacent seat. Regardless of the booking class, an infant held by a parent is entitled to 1 piece of checked baggage weighing no more than 23 kg as well as a collapsible stroller and a car safety seat. Children flying in their own seat, secured in a child safety seat, receive the same hold luggage allowance as adults plus they can have a foldable stroller and a car safety seat in addition to that. Baby bassinets are available on board for infants aged up to 6 months. They should be booked in advance. Bassinets have an inside length of 70 cm and support a maximum weight of 11 kg. Parents do not receive a full luggage allowance for a baby aged up to 2 years without a reserved seat. Foldable strollers or car safety seats up to a total maximum weight of 10 kg will be carried free of charge as checked luggage for any infant or child on the booking. It depends, however, on space availability in the aircraft compartment. If there is insufficient space, strollers and car seats will be forwarded on the next available flight. Anything heavier than 10 kg will be charged as excess luggage. Infants (under 2), held on the lap of an adult are given one free checked bag not exceeding 23 kg with a maximum dimension of 158 cm (regardless of the destination and travel class). Free baggage allowance includes a collapsible baby stroller. Babies under the age of 2 traveling on their parents’ lap are entitled to one free checked bag not heavier than 23 kg (regardless of the destination and travel class). Children over 2 years of age have the same free baggage allowance as adults. Foldable strollers, car seats or baby baskets may be brought on board as additional carry-on at no charge. To increase safety, children up to 7 years old can travel in their own car seats for free. However, this option is available for infants (0-2 years) only with a child ticket purchased (as s/he is not going to be carried on the lap). Your car seat must be in perfect working order and should meet all the required safety standards. If it does not fit safely into the aircraft seat, it can be carried in a hold for an extra charge. There is no carry-on baggage allowance for infants younger than 2 years and not occupying a seat. As a parent, however, you are permitted to bring on board baby food necessary during the flight. You can also check-in a bag up to 5 kg. You can pack baby’s items into your own bag (5 kg is added to your baggage allowance) or bring a separate bag for your child. Other children are entitled to the same amount of luggage as adults. A foldable baby stroller or car safety seat may be brought without a fee for children aged 11 or less. Passengers traveling with a child up to 11 years of age are permitted to check-in one collapsible stroller free of charge. If your baby (0-2 years old) is sitting on your knees during the flight, your hand luggage allowance will include 1 bag no heavier than 10 kg and no larger than 50 x 37 x 25 cm. Luggage weight limits may vary depending on the booking class and the destination. When flying with an infant to and from Argentina, Brazil, Canada, and the United States in the First Class, you are entitled to one checked bag up to 32 kg. It the economy class, you will be allowed 23 kg. Infant fare on all other routes includes one piece of registered luggage up to 10 kg, regardless of the booking class. Passengers with children can carry 2 items of equipment free of charge – one collapsible stroller and one of the following items: car safety seat, booster seat or travel cot. These items can be tagged for travel at a bag drop desk up to 40 minutes prior the scheduled flight departure. Strollers may be also taken right up to the aircraft steps and then stored in the hold. Babies aged up to 2 years are allowed to travel in car safety seats. They must, however, occupy an individual seat reserved at the child fare. Passengers who have purchased a separate seat for an infant can bring on board hand luggage up to 10 kg and a small second bag. They will also have the option to purchase a registered baggage. Infants younger than 2 years can travel on their parents’ lap or in their own car safety seat. When choosing the latter option, you will have to book a seat at the same price as for an older child. Babies held by adults are not entitled to any hand luggage but can have a checked bag up to 23 kg. A child car seat that is not used on board will be transported as hold luggage. Foldable strollers for infants aged 2 or less can be checked-in for free. A stroller for an older child counts as a piece of luggage. Children from 6 months to 3 years of age occupying a reserved seat are allowed to use their own car safety seat aboard (when it’s approved by airworthiness authorities). Also, special baby bassinets are provided by Singapore Airlines. Each is 70 cm long and supports a maximum weight of 14 kg. It is recommended that you book a bassinet in advance, as only a limited number is available and offered on a first-come, first-served basis. Infants up to 2 years of age are entitled to checked baggage weighing no more than 15 kg (domestic flights) or 20 kg (international flights) as well as a car seat and foldable stroller. You are allowed to bring aboard your own car seat for use by infants as long as it is certified as suitable for air travel. Babies younger than 2 years can be held on the lap of an adult or use car safety seats. Any child aged 11 or less is also permitted to use their own car seat on board of the plane. Swiss offers bassinets for infants under 8 months of age and weighing no more than 11 kg. They are available for all travel classes on long-haul flights and on business class flights within Europe. Children up to 5 years of age are permitted to travel in car safety seats if it’s qualified for use in aircraft. Babies aged 2 years and less without reserved seats can be placed in a bassinet available on board. They are 70 cm long and support a maximum weight of 10 kg. The access is limited, so it is recommended that you reserve a bassinet in advance (e.g. when booking a flight). You can bring a car seat on to the aircraft for the child to sit on. This option is available only if an additional seat is purchased. You are also allowed to take a foldable stroller – it can be brought to the aircraft steps and then will be stored in the hold. Babies under the age of 2 traveling on their parents’ lap are entitled to one free checked bag not heavier than 10 kg. An infant (under the age of 2 years) can be carried on your lap. When your baby turns 6 months old, s/he can use a car safety seat suitable for air travel. However, this option is available only if an additional seat is purchased. Baby bassinets will only be accepted on long-haul flights – just make a request when booking. However, you can’t use it during the flight. Your bassinet should be placed in the aircraft cabin. A foldable baby stroller may be brought without a fee for infants aged 2 or less. Passengers traveling with infants (0-2 years old) can take a foldable stroller with them, free of charge. It should be brought to the aircraft steps and then will be stored in the hold. The staff will return it just after landing. If you are traveling with a baby younger than 2 years of age, you will be allowed to take a foldable stroller or small crib in addition to your carry-on.